I don't get it, why do people write bad reviews if they haven't even taken the time to read the novel to it's fully translated form? Why bash something when you don't know how things will turn out? All I see from the bashers is that they either stopped at around chapter 50 or lower or they didn't even deign to show until when the read. IMO those people aren't worthy to make reviews as they will only denigrate good novels and make them unpopular even though at the later stage the novel... more>> might become world-class. I personally enjoy the novel greatly, wonderful character-building, proper world setting, short and succint fights makes it a joy to read. Really hate those authors who decide to write out a single clash among the MC and a worthless mob character for dozens of chapters. For a 'genius' that's been living hundreds of years that is a very dissapointing point, he has 6 years to check the common sense of the world he's living in but he's still being an idiot that think everything is still like the standard of his past life. Grow the f**k up. Similar with "Death March kara Hajimaru Isekai Kyusoukyoku" translated by the same translator Sousetsuka, this is a story about over-powered main character breaking common sense. The difference is the MC in this series is more agressive than Satou from Death March and actually growing from weak to strong in a gradual way. The pace of the plot in the story is quite fast with a little bit short word counts per chapter, but the author updated every other 2 days. Do you like well written and thought-out characters who engange with another in an interesting way? Do you enjoy partaking in epic quests, where the MC has to give his all to prevail, just to come out stronger than before? Would you like to read a story so engaging that you can't stop binge reading all the chapters at once? Well, if you answered any of those with yes, this Novel is definitely not for you! Rinse and repeat for over 130 chapters. You'd think people would've already adapted to the OPness of the MC, but even his side-chicks get surprised EVERY fricking time whenever he pulls some Deus-Ex-Machina moves. If you value your reading time - don't even start with this. This story COULD get interesting once the MC reaches adulthood and gets older so he gets pretty much the same "Body-Capacity" as his pre-reincarnation self, but with the pace of this story, that could easily take 600~700 more chapters. If Isekai were food, this would be the equivalent to a plain burger from McDonald's. It barely has substance, and is bad for you. However, despite its lack in taste it's enjoyable in the sense that there's plenty of it and pretty easy to go through. It's pretty much a guilty pleasure. In case if you already forgot the synopsis or didn't read the title, it's about the strongest mage, sage, or whatever the hell you call them reincarnating himself into the future because his genetics lacked the talent to become stronger.... more>> He then awoke one thousand years into the future to discover that instead of humanity progressing in state of the art technimagibamboozlery, the lil' dunces regressed. That's a good concept, except everyone who ever lived vomits endless praises for the MC's actions. Hell, I could probably make an abridged example on the spot about the MC's massive ego d*ck. If you want to imagine the interactions in action, literally search up any Family Feud video with Steve Harvey as the host. It's not exact, but the feeling is all the same. Translator is doing a real good job though so props to him/her on that. OP-MC slaughtering common sense for fun, that's how I would describe it. But that's it, just that nothing extraordinary new nor unique. Basically anyone that meet MC either get rekt, or admire him to praise him over and over. 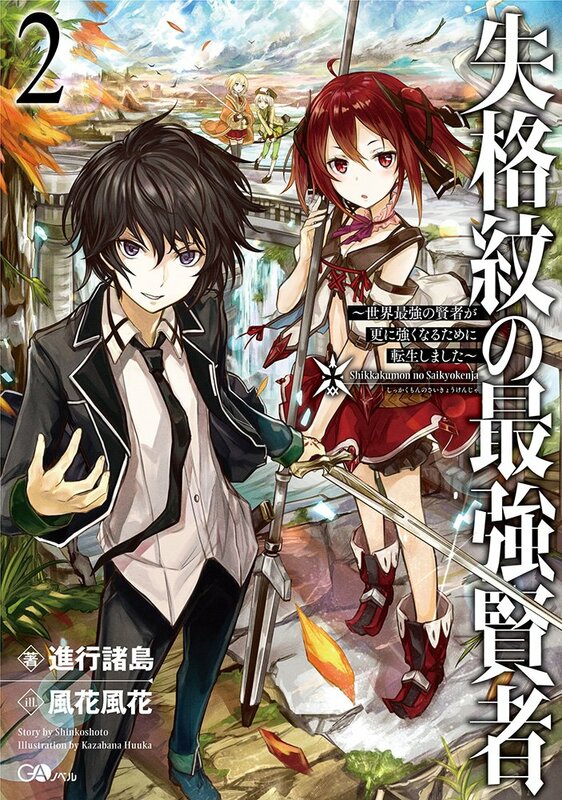 The story is your usual trope with slight different name and spec, and also there seems to be some flawed logic behind the premise of reincarnated to the future, yet the magic and technology is getting on decline. (Though it is highly connected with the past self MC). If you want to look for a enjoying slice of live, semi comedy, OP-MC, and wrecking story's common sense, then this is for you. I'd say that this story is your usual OP main character that "breaks common sense" though I just wish the author has a bit more creativity. You can see these types of story everywhere yet it's like the author doesn't even try to be creative. Everyone that discriminates against him gets facerolled by his OP-ness in a mere chapter or two, or even in a few paragraphs. The MC does something and everyone gets awfully surprised just to accept it like it's normal after a few words. "Calamity Class" monsters appearing in front of him just so that he can show to others that he's OP. The MC met a demon and after a chapter he magically and omnipotently arrived at a conclusion that the way the weakest crest was called the strongest crest now and his crest was discriminated against (coincedentally and magically) as a disqualified crest and how the magic and everything the humans do became incredibly weak and subpar than his time was because of the Demons. The Demons did that because it'll be better for them if the humans are weaker but let's be honest here. The discrimination shown in the story is not something that just appeared out of nowhere, it's something that is deep-rooted as said in the story, and he's even stronger than the knight's commander at his age, that means their country is too weak. If they're that weak then it would've been so easy.. Too easy for demons to conquer them seeing as how that demon he fought has a higher magic output than him who could kill a "Calamity Class" monster. Overall, even if I'm harsh with my review, I still read it because I like "reincarnation" and "transmigration" type of novels. So many of these commenters are idiots- this is NOT AN ISEKAI- it's TIME TRAVELING/REINCARNATION; it just happens to be set in a FANTASY WORLD. EARTH IS NEVER MENTIONED, NOR JAPAN OR ANY OTHER COUNTRIES- NOT ISEKAI; NOT TWO DIFFERNET WORLDS. It also has relatively zero game elements in it as well, the only thing reference from gaming is "exp" and that's to be expected in a magic based story since EXPERIENCE is generally needed to control and to harness magic proporly. The MC is OP because he came from a... more>> more advanced time period, not just because. He became powerful with CENTURIES of hard work and effort- clibing up from the bottom of the pile to the top. Mathius reincarnated himself so that he could achive things he'd never been able to before- he'd expected everyone to be around his same power level as he had been back then by the time he was reborn; however thanks to the reactor meltdown that caused Iris's wings to become useless advancements were lost completely and humanity had to start from scratch. Demons also came into play and manipulated mankind so they wouldn't get as powerful as before. This is a FANTASY about a guy who wishes nothing but to be the BEST HE CAN BE. Along the way he also starts to REHABILITATE humanity so that it can retain it's former glory and eventually surpass it. As soon as all of you guys read a fantasy WN or LN nowdays you IMMEDIATELY ASSUME it's isekai- which is NOT ALWAYS thr case. In my opinion this has quite a few western vibes mixed with Japanese LN tropes so that it's TARGET AUDIANCE- THE JAPANESE- CAN RELATE TO IT and it can catch popularity in it's home country and stuff. Many of you also bash on the common sense- if you were teleported to a place with no electricity and magic and no plumbing or running water how you act? You'd be pretty fumbly and bad. You would probably act on first-world instinct for a lot of things and think if items to rely on that aren't available- you'd be completely lost and probably end up a begger or dead if you lived on your phone and social media. Once your thrown there you have very little to get you to a happy life, surviving the winter and wildlife and bandits and such would be hard, learning to farm all your life might be tge only option- and that would give very little pay. Our sense of money would be completely different, and it'd be so I trained into our brains that it's take YEARS for mist if us to get used to ANYTHING. For the MC he was basically thrown into the age of the black plague of magic. He was from a technologically advanced time/place as well in addition to the magic, then he's thrust into the middle ages that's basically being manipulated by another intelligent species- demons. For ONLY six years there he's adapted quite well, he wasn't a genius either, he just worked harder than others and PROBABLY ALREADY THOUGHT UNUSUALLY EVEN FROM HIS ORIGINAL TIME. He is a genius and is great at adapting to the situation- but he still expects things to be there that aren't- AND SO WOULD WE IF WE WERE IN HIS SHOES. The premise is extremely lazy. The MC has what he considers to be an inferior crest, but he still manages to become the most powerful magician in his era. However, despite being the strongest, he is still not satisfied and casts a reincarnation spell on himself to hopefully reroll into a better crest. Before I read this starting garbage, I didn't believe it was possible for a worse starting premise than "MC gets hit by truck and is reborn". I now stand corrected. By chapter 5, it becomes incredibly clear that in his new life, the technology and magic has regressed severely. However, the MC REPEATEDLY refuses to believe it no matter how many examples he encounters or what people tell him. He is dense to the point that I would be banging my head against a wall even if this story WERE a misunderstanding themed comedy, which it is not. The MC is SO powerful that he's beating much, much stronger opponents even as a child. He is so strong and ridiculously overpowered that he leaves no room for anyone else to do anything. He waves his hand and creates super strong items, casts super powerful spells, and upends common sense all without any training or practice. As a result of 3, all the side characters have nothing to do except hang on to his coattails. They are not people. They are instruments that are constantly used to comment on how awesome MC is. Do NOT read this story, even if you're new to the genre. I firmly believe trying to will make you less intelligent. The novel is nothing more than an exercise in juvenile wish-fulfillment and has almost no redeeming qualities. Okay, this novel is not bad at first but keep declining in every chapter until it's very unbearable to read. The author bring the lack of common sense too far that it's not even funny anymore, it's just... REALLY? it's kind of novel you can't take seriously, just like Manga wo Yomeru. The response of MC's lack of common sense is also weird, no one take advantage of naive, and stupid MC, no scheme, everyone is stupid or maybe.. kind? everyone is good person, including the enemy. The story starts out pretty great but after reading they should just rename this story to "The most moronic sage in the world". First off this isn't a isekai story, the main character is a several hundred year old sage who found a way to reincarnate himself so he can get a more combat orientated 4th crest (he originally had the first crest which is mainly used for enhancing/making gear). The MC is from the same world so shouldn't have any common sense issues and share some of the values... more>> or beliefs in the world. That's just wishful thinking, the main character isn't smart, he's dumb as a bag of rocks. Everyone else is also written to be so stupid that by contrast, he seems smart because he has ancient knowledge. How does a several hundred year old sage not understand anything about his surroundings several years after he's reborn? Why did a man who lived for nearly 1000 years have no critical thinking skills or problem solving experience? Multiple characters repeatedly tell him that the level of magic and fighting are a lot lower now than his previous life but he JUST DOES NOT UNDERSTAND THIS, HE DOES NOT UNDERSTAND THIS AT ALL IT DOES NOT GET INTO HIS BRAIN AT ALL. Not only that but his old friends from his previous life are all now insanely famous and legendary world renown heroes but the main character somehow doesn't understand this either. He thinks its all a coincidence and wonders why test questions asked about sword style/etc sharing the same name as his old acquaintances. His briefly mentions how in his past life with the first crest he could make weapons with ~20 augmentations, then he goes to a weapon shop in a large city and makes a 2 augmentation sword which dazzles everyone around because 2 augmentations are National class treasures that belong to the Royal Treasury. Somehow the MC doesn't realize that the world is in decline he just thinks the blacksmith is hiding his real gear in the back because stores don't like selling products. The MC is so dense and so stupid I don't even understand how he's alive, I'm pretty sure he could drown by looking up while it's raining. A boring MC can work if it has colorful and interesting world or side characters. I can't even remember the name of any side characters in this story. They are such cliche and stereotyped characters they are effectively invisible in the story and only serve to be impressed at how amazing the MC is at everything under the sun. The other huge flaw in this story is that they repeatedly talk about how much better the 4th close combat crest is so much better than the 1st crest but... you're never really shown or told why its so much better. The MC just uses the same few basic skills, they are just a bit easier to use but that's about it? He gave up his previous life and thousands of years just for this and you don't see the pay off on why he'd go to such drastic lengths to get this crest. He defeats everything he could defeat in his previous life just as easily and fast. Yet he still complains about how it took him almost a minute to beat some super strong monster in his previous life so he needs to be even stronger so he can defeat it in a few seconds because otherwise ???? They never mention why this matters or where these super ultra strong monsters are. Why the human world hasn't been ended by these god like beings that the MC thinks might exist but has never seen or heard of them before. Everything seems to be made up on the spot as they go. Nothing is really set up and there are no real payoffs to any subplots. The combat is boring and ends with everything getting super murdered. There's a general plot about how the demons intentionally weakened the human world by spreading misinformation about how to use magic and the usage of magic crests. However you never really find out how or why they do this, or why they didn't just take over the human world with their power when no one can even hope to stand against demons. The MC and the author don't even care about any of this he just goes around killing demons for no real reason or benefits to himself. It's not because he's practicing or testing his limits, he just does it because the story needed him to while other times he refuses because... well just because? The MC also immediately builds a giant anti demon barrier with the full support of the entire school by chopping at the dungeon walls and somehow refining the ore in the walls then tapping into a vein of energy under the city that powers it all. Wow, that was anticlimactic and everyone from the King to the school's staff places their absolute trust in a random ~12 year old kid wanting to do what they think are absolutely impossible and unheard of things. The story is about lack of common sense, yes, the MC is lack of common sense and so naive. The series is disappointing, mainly because the MC falls under the "super amazing but amazingly dense" trope. In this case, despite all the evidence presented to him, he just doesn't seem to understand how the new world he's in works. He repeatedly ignores that he's now the strongest person alive or that the magic from his past life has largely been forgotten. Also, he doesn't bother to find out the history of this new world, despite there being the resources to do so around him. Also, apparently in his past life,... more>> which apparently lasted over a thousand years, he never had a girlfriend, and doesn't know how to act around a girl he likes. The world also seems custom made to show off how amazing the MC is. He doesn't even have to try; on his first day of school, the principal calls him to his office and begs him to literally fight for the school's honour or they risk being forced to submit to heir rivals. From what I have read so far into the story this is like a usual Jap novel.. OP MC with no common sense or the knowledge of how to talk to people especially girls, mind you he is someone who has lived for hundreds of years. From the looks of it its going to turn into another one of those harem novels with bunch of girls all over MC by the end of it, and MC still having problems talking to them. Like he is a old man in the... more>> previous life and now he cant even talk to a 13 year old girl. I understand that he has lived his previous life in solitude, but common thats just stupid. Another part that keeps bothering me is how everyone just accepts how op MC is like its common everyday thing even though they have some crazy reaction every time he does something. Well if you are into a OP MC that is very thick skinned with people around him not questioning anything then this is a novel for you. In my opinion, the story is not that bad. Yes, the MC is a jap MC who's lacking common sense despite living for centuries before reincarnating, not to mention the other usual tropes. But the thing that bugs me the most with this novel is the pacing. I can pretty much sums the chapters with 20% recap of last chapter, 35% problem+solution talk, 45% inner monologue on why solution works/not works, finished with a line that leads into a stupid cliffhanger, IN EVERY CHAPTER. Not helping that the chapters are short. The... more>> cliff after cliff after cliff gets tiresome after awhile. I would give this 1 star except that I like the idea of OP MCs. Even then, this piece of sh*t is horrible by any standards and I hesitate to call it a 'novel' or a 'story'. It might be acceptable that people lost their knowledge of magic over a long period of time given the idiocy of the masses but the mechanic that the imbecile writing this sh*t used makes no sense. The background behind how the world works is sometimes subject to change, and really, nothing is all... more>> that enjoyable because there are way too many Deus Ex Machinas EVERYWHERE. You get mithril from f*cking walls for the love of all that's [email protected]$&%^) ^*&@#*%$!!!!!!!!!! As others have stated before me: the chapters are too short. You literally have a single chapter devoted to the preparation of a meal and, unlike Death March, there is no running around for ingredients across a continent, it's just cutting up food to put in a pot. Nothing happens and a whole chapter is devoted to a single sentence or paragraph's worth of ideas. Its literally like a slap to your face because, it builds up characters and relationships to only disappear. Even in the mist of important battles they become non-existence. Frankly, I just had to stop at chapter 28.... the main character is just too stupid for things to be enjoyable. It is so-so. While you begin to read it you wonder why it has such a mediocre rating if it's rather fun, but by chapter 100 at latest you'll surely understand. MC is just a Mary Sue character. Everything always goes according to his plans. Author wants the MC to appear like someone who uses smarts in fights, but in the end it's only at the level of "OMFG this demon is so stupid to fall for obvious faint ROFL" every single fight. In the later chapters his plans are... more>> a bit more elaborated, but given his power level I couldn't help but question if plan was even necessary. In the even more later chapters (like about chapter 200) there's finally some challenging content that makes MC unsure he can win, but by that point the novel stopped being interesting to me anyway. This is kind of sad to me. I like this novel at first beacase it has the same vibe as "death march" but after some reading it just clear as day that this novel is not on the same level. Like any other OP main character, he break a lot of common sense it's the fun of this genre after all. But it's just that nothing more to offer. The plot look quite promising but it's just so boring that I can't stand reading anymore.